While carefully observing the production line of glass bottles, which were being packed as 10 bottles per package by machines, an inquisitive mind questions – How does the machine knows to count the number of bottles? What teaches the machines how to count? 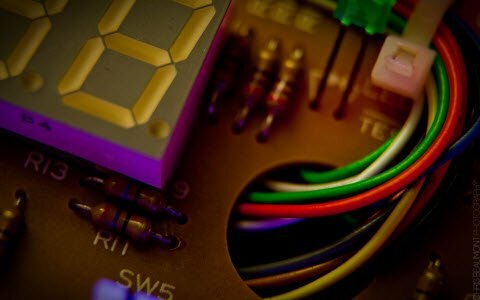 Searching an answer to solve this curiosity will lead to a very interesting invention named – “Counter’s”.Counters are the circuit which count’s the applied clock pulses. These are usually designed using flip-flops. Based on the way clock is applied for their functioning counters are classified as Synchronous and Asynchronous counters. 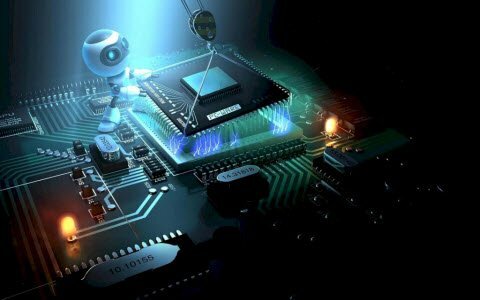 In this article, let us look at an Asynchronous counter which is notoriously known as Ripple counter. 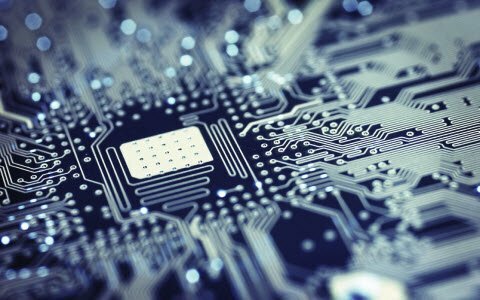 What is a Ripple Counter? Before jumping to Ripple Counter let’s get familiarized with the terms Synchronous and Asynchronous counters. Counters are circuits made using flip-flops. 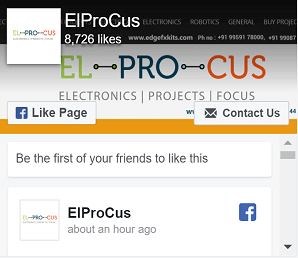 Synchronous counter, as the name suggests have all the flip-flops working in sync with clock pulse as well as each other. Here clock pulse is applied to every flip flop. Whereas in Asynchronous counter clock pulse is applied only to the initial flip flop whose value would be considered as LSB. Instead of the clock pulse, the output of first flip-flop acts as a clock pulse to the next flip flop, whose output is used as a clock to the next in line flip-flop and so on. Thus, in Asynchronous counter after the transition of the previous flip flop transition of the next flip flop takes place, not at the same time as seen in Synchronous counter. Here flip-flops are connected in Master-Slave arrangement. Ripple Counter: Ripple counter is an Asynchronous counter. It got its name because the clock pulse ripples through the circuit. An n-MOD ripple counter contains n number of flip-flops and the circuit can count up to 2n values before it resets itself to the initial value. These counters can count in different ways based on their circuitry. UP COUNTER: Counts the values in ascending order. DOWN COUNTER: Counts the values in descending order. UP-DOWN COUNTER: A counter which can count values either in the forward direction or reverse direction is called an up-down counter or reversible counter. DIVIDE by N COUNTER: Instead of a binary, we may sometimes require to count up to N which is of base 10. Ripple counter which can count up to value N which is not a power of 2 is called Divide by N counter. The working of the ripple counter can be best understood with the help of an example. Based on the number of flip flops used there are 2-bit, 3-bit, 4-bit….. ripple counters can be designed. 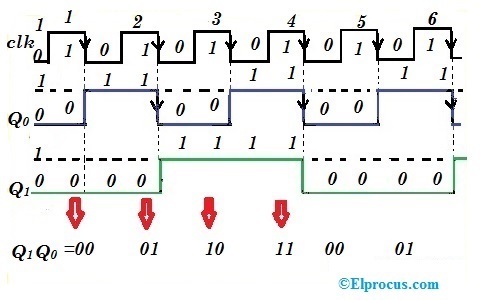 Let us look at the working of a 2-bit binary ripple counter to understand the concept. A binary counter can count up to 2-bit values .i.e. 2-MOD counter can count 22 = 4 values. As here n value is 2 we use 2 flip-flops. While choosing the type of flip-flop it should be remembered that Ripple counters can be designed only using those flip-flops which have a condition for toggling like in JK and T flip flops. 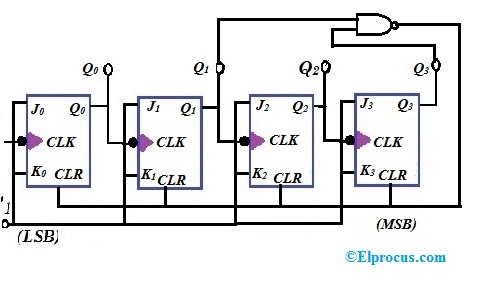 The circuit arrangement of a binary ripple counter is as shown in the figure below. Here two JK flip flops J0K0 and J1K1 are used. JK inputs of flip flops are supplied with high voltage signal maintaining them at a state 1. The symbol for the clock pulse indicates a negative triggered clock pulse. From the figure, it can be observed that the output Q0 of the first flip flop is applied as a clock pulse to the second flip flop. Here the output Q0 is the LSB and the output Q1 is the MSB bit. The functioning of the counter can be easily understood using the Truth Table of JK flip flop. So, according to the Truth table, when both the inputs are 1 the next state will be the complement of the previous state. This condition is used in ripple flip flop. As we have applied a high voltage to all the JK inputs of flip-flops they are at the state 1, so they must toggle the state at the negative going end of the clock pulse .i.e. at the transition 1 to 0 of the clock pulse. 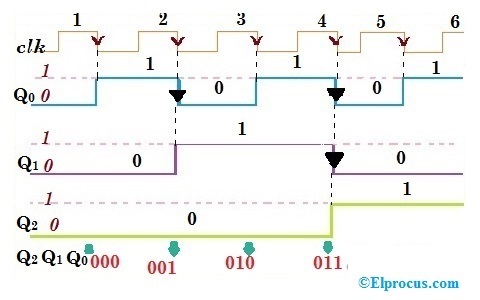 The timing diagram of the binary ripple counter clearly explains the operation. From the timing diagram, we can observe that Q0 changes state only during the negative edge of the applied clock. Initially, the flip flop is at state 0. Flip-flop stays in the state until the applied clock goes from 1 to 0. As the JK values are 1, the flip flop should toggle. So, it changes state from 0 to 1. The process continues for all pulses of the clock. Coming to the second flip flop, here the waveform generated by flip flop 1 is given as clock pulse. So, as we can see in the timing diagram when Q0 goes transition from 1 to 0 the state of Q1 changes. Here don’t consider the above clock pulse, only follow the waveform of Q0. 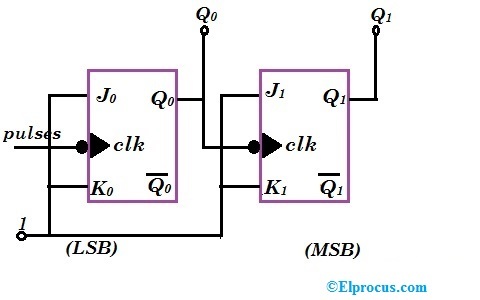 Note that the output values of Q0 are considered as LSB and Q1 are considered as MSB. From the timing diagram, we can observe that the counter counts the values 00,01,10,11 then resets itself and starts again from 00,01,… until clock pulses are applied to J0K0 flip flop. In the 3-bit ripple counter, three flip-flops are used in the circuit. As here ‘n’ value is three, the counter can count up to 23 = 8 values .i.e. 000,001,010,011,100,101,110,111. The circuit diagram and timing diagram are given below. Here the output waveform of Q1 is given as clock pulse to the flip flop J2K2. So, when Q1 goes from 1 to 0 transitions, the state of Q2 is changed. The output of Q2 is the MSB. In 4-bit ripple counter, n value is 4 so, 4 JK flip flops are used and the counter can count up to 16 pulses. 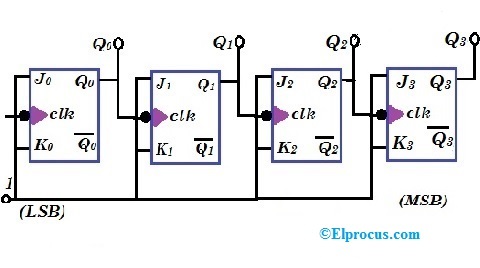 Below the circuit diagram and timing diagram are given along with the truth table. 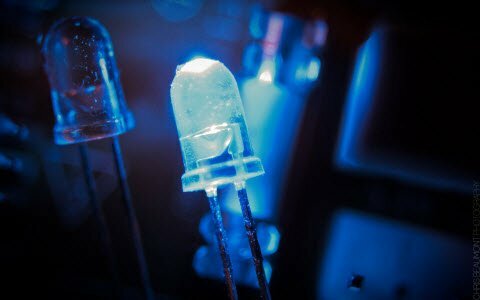 When it comes to selecting a Flip Flop for Ripple counter designing an important point to be considered is that the flip flop should contain a condition for toggling of states. This condition is satisfied by only T and JK flip flops. From the truth table of D flip flop, it can be clearly seen that it doesn’t contain the toggling condition. So, when a used as Ripple counter D flip flop has initial value as 1. When the clock pulse undergoes the transition from 1 to 0 the flip flop should change the state. But according to truth table when D value is 1 it stays on 1 until D value is changed to 0. So, the waveform of D0-flip flop will always stay 1, which is not useful for counting. So, D flip flop is not considered for construction of Ripple Counters. Ripple counter counts values up to 2n. 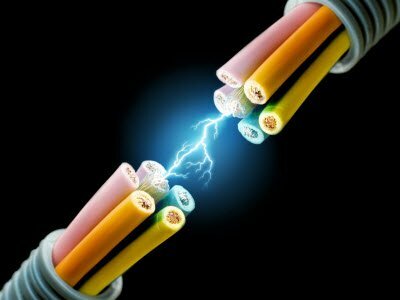 So, to count values which are not powers of 2 is not possible with the circuitry that we have seen till now. But by modification, we can make ripple counter to count the value which cannot be expressed as a power of 2. Such a counter is called Divide by N counter. The number of flip flops n to be used in this design are chosen in such a way that 2n > N where N is the count of the counter. Along with flip flops, a feedback gate is added so that at count N all the flip flops get reset to zero. This feedback circuit is simply a NAND gate whose inputs are the outputs Q of those flip flops whose output Q = 1 at the count N.
Let us see the circuit of a counter for which N value is 10. This counter is also known as Decade counter as it counts up to 10. Here the number of flip flops should be 4 because of 24= 16 > 10. And at a count of N= 10 the outputs Q1 and Q3 will be 1. So, these are given as inputs to the NAND gate. The output of the NAND gate is applied to all the flip flops thereby resetting them to zero. 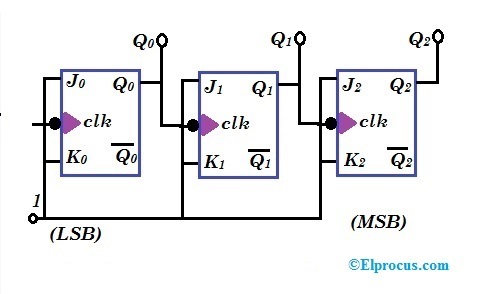 The carry propagation time is the time taken by a counter to complete its response to the given input pulse. As in ripple counter, the clock pulse is Asynchronous, it requires more time to complete the response. These counters are frequently used for measurement of Time, Measurement of Frequency, Measurement of Distance, Measurement of Speed, Waveform generation, Frequency Division, Digital Computers, Direct Counting etc…. 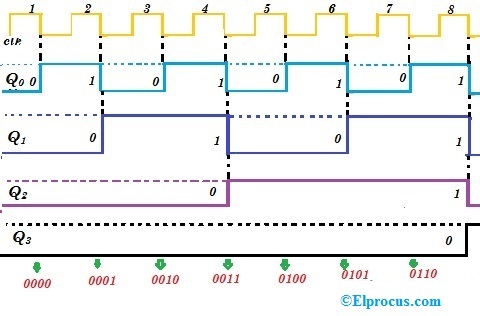 Thus this is all about brief information about ripple counter, the working of binary, 3bit And 4-bit counters construction using JK-Flip Flop along with circuit diagram, ripple counter timing diagram, and truth table. The main reason behind the construction of the ripple counter with D-Flip Flop, disadvantages and applications of Ripple Counter. here is a question for you, what is 8-bit Ripple Counter?